Situations in which you must deal with a lot of people always bring with them a great deal of temptation to take unethical short cuts. Situations in which you deal with a lot of money always bring with them a great deal of temptation to take unethical short cuts. And situations in which you spend most of your day unsupervised always bring with them a great deal of temptation to take unethical short cuts. Put all three of those together and you have the daily working environment for a salesperson. Every day, there is, in some way, an opportunity to take an ethical shortcut. The list of possibilities is endless – everything from exaggerating a product’s features, promising impossible delivery, speaking badly about the competition or your colleagues, selling free samples, fudging your expenses, running personal errands on company time, etc. That’s why a strict code of ethics is such an important attribute of a professional salesperson. Without it, the temptation to take unethical short cuts can become unbearable. And, just one ethical short cut can ruin a relationship with a customer and derail a salesperson’s career. A strict code of ethics is just what it says it is. Strict, unimpeachable, non-negotiable, black and white decisions, made before the actual event, about what you will and will not do. The best salespeople have a well-thought out system of right and wrong, and are secure in their commitment to it. They take the time, in a calm, non-stressful time, to think deeply through their guidelines for their behavior. They make decisions about what they will and will not do. Some even commit that to paper. Then, when they are in the midst of a sales call and are faced with the need to make an immediate decision, they have no qualms about it. They have already made the decision. Here’s an example. Let’s say that one of the ethical guidelines you created for yourself is this: I will never speak badly about the competition. But, since you did make the decision, you keep quiet and don’t comment at all. The conversation moves on. Your code of ethics prevented an impulsive action that may have made you look bad. A strict code of ethics makes decisions easier, reduces stress, and builds a reputation of trust from both the customers, as well as the salesperson’s management. That’s why it is a best practice of the best salespeople. If you are a member of The Sales Resource Center™, consider Pod-34: Ethics for the Professional Salesperson, and Nuggets N-19: Ethics; N-96: Integrity; and N-215: Ethics for sales people. Dave Kahle is one of the world’s leading sales educators. He’s written nine books, presented in 47 states and eight countries, and has helped enrich tens of thousands of sales people and transform hundreds of sales organizations. Sign up for his free weekly Ezine. 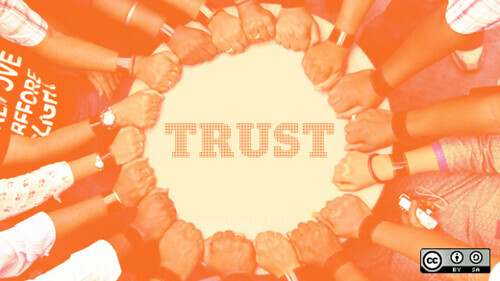 Image “Creating the high-trust organization” by opensourceway on Flickr, available under Creative Commons license.